Every DIY kind of person already now that a cordless drill driver is a hundred percent must have tool. The cordless drills come in handy for a lot of tasks, ranging from just putting a few things together to running a personal project. Not because of the scarcity, but we understand that the market might be a little too hectic to make a purchasing choice for a specific brand. Viewing it from a positive perspective, you have the luxury of making a selection from a variety of manufactures, as each brand has its share of good aspect to offer. Beyond just cordless drills, some companies expand their productions to drill driver kits, DeWalt is one of them. It is highly possible you might have heard of the DeWalt DCD771C2 from a friend or seen it from an advert. But even though this tool comes in handy for a lot of applications, as a buyer, it is necessary to be quite knowledgeable on the performance and characteristics of the machine you intend to own. Luckily, we have done a review on DeWalt DC771C2, which is one of the best cordless driver drills in the market today. The DeWalt DCD771C2 is great for many of the tasks around the house. This cordless drill may not be the best pick if you want one specifically for heavy duty, but it remains a handy tool. The compact Design of the DeWalt DCD771C2 makes it easy to use in tight spaces use (as long as you are not a stranger to a ratcheting chuck). It is also made to have a lightweight; weighing only 3.6 pounds with the battery. You have the options of two-speed settings, one with a maximum of 450 RPM and the other with 1,500 RPM. DeWalt DCD771C2 supports reverse mode, and the clutch has 16 settings. For those dark work areas where you still have to be precise about your accuracy, the DCD771C2 has built-in work light. The item is packed with two batteries in the keep your work uninterrupted and a fast charger that can completely charge your battery in 40 minutes. An extra is a soft bag that is large enough to contain the cordless drill, two batteries, the charger and a lot of drill bits. Even though this DeWalt product might not have the excessive sophisticated features, it is good value for the price and also a complete tool capable of all home tasks. You do not get a tool belt and driver or drill, but with your item, but with a three-year warranty, a 90 Day money back guarantee, and one-year free service contract, you may never get a better deal in the market than this. We would proceed by picking out and discussing some of the features DeWalt DCD771C2 has to offer. 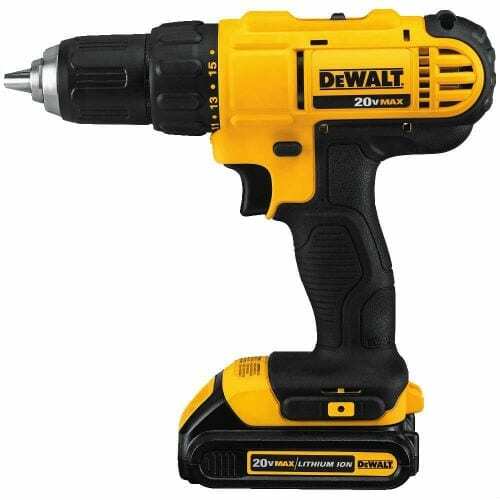 We have spoken a bit about the battery in our introduction, but to shed more light on the details – The DeWalt DCD771C2 is not the most powerful drill, but it uses a 20 volt lithium-ion battery, which is an upgrade to the regular 18 volt batteries, and powerful enough to deliver up to 300 units watt of power. Being a lithium-ion battery, you are sure to get more power regardless of the lightweight. The battery is good for standard uses; it charges as fast as 30 minutes and can cope with a long period of usage. When it is fully charged, it automatically shut offs the charging process. To be more attractive and convenient for the operator, DCD771C2 comes with an extra battery so you can have one charging while you work and swap them periodically for uninterrupted work. If you want a cordless drill that gives sufficient speed while you work, then DeWalt DCD771C2 puts you on the right track. It delivers high-speed transmission and offers them in two speeds; one is between 0 and 450 RPM, while the other is between 0 and 1,500 RPM – which in other words means the maximum rotation per minute achieved is 1,500 under zero load condition. The variable speed options give the opportunity to select the speed level for a wide variety of drilling and fastening applications. But then again, the speed choice would depend on the kind of task you are working on and your level of skill. Apart from the variable speed settings that are conveniently positioned, so you don’t have to let go of the handle to adjust the speed, this DeWalt tool also comprises of 15 other settings to perform a range of jobs. We can agree that a drill that is not too heavy would be a preferred choice. The lightweight is one of the best features of this particular DeWalt model. Even with the high-quality material used in making the DCD771C2, it weighs only 3.6 pounds, so you can keep on with your work without worrying about fatigue. Measuring only 13.9 x 9.9 x 4.2 inches, this cordless drill is also made to be compact. This aspect gives you the flexibility to work in tight spaces. Any DIYer can testify to how a compact and lightweight cordless drill contributes to the efficiency and accuracy of the project. 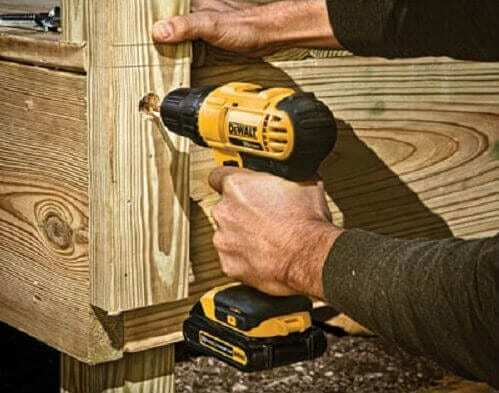 Using a cordless drill would involve you having to hold it, and as we have mentioned, the DeWalt cordless tool is lightweight and keeps the pain and tension away so you can handle it with convenience for hours. Now talking about handling, the drill is constructed with an ergonomic handle to keep your hands, arms, and wrist from strains. The comfort of the handle and knobs is important for improved control and confidence to maneuver the machine while operating it. The handle is designed nicely to sit comfortably on the curves of the palms. Also, they are made with rubber bumpers to prevent friction and have lengthy grip surface are to make sure they do not slip during a long period of handling the drill. Although, some people may consider the work light as unnecessary, if you think about the situations where you have to work in dark areas, like inside a kitchen cabinet or under the sink, the light is invaluable. The other alternative option of using a separate light in those tight dark areas causes inconvenience, but the DeWalt DCD771C2, on the other hand, has an LED light located right above the trigger to illuminate the work area whether you are driving or drilling. You should also know that it automatically turns off 20 seconds after you release the trigger. For a choice on a simple, compact and lightweight cordless drill, with plenty of power to get your project on, the DeWalt DCD771C2 is perfect. There is no disappointment with this tool, which is why we do not hesitate to recommend to any DIYer for home projects. The DeWalt tool is a good drill that will not let you down; it is neatly packaged with enough items to get you started. It is built with intentions for homeowners, not commercial use; it can withstand the knocks and bumps of home projects, and still deliver a reliable service. DIY newbies can also give this tool a trial since there is a low-speed option to help them catch up. It charges fast to provide you with enough work time and come with LED lights for work convenience. 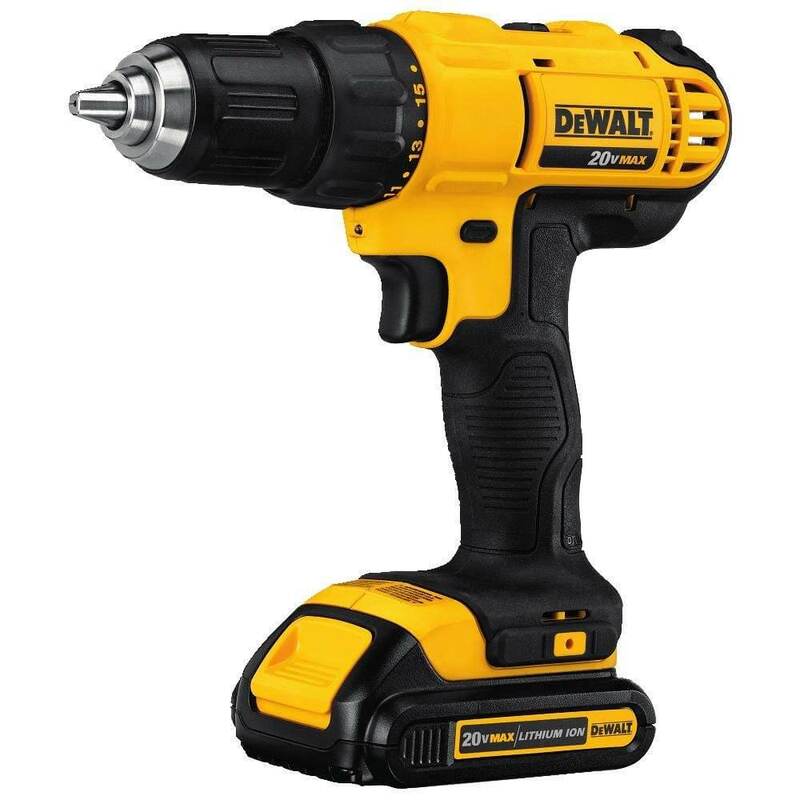 In the crowded field of consumer-grade cordless drills, DeWalt DCD771C2 comes with all the right features, two batteries, a charger, a rugged large carrying bag, all offered at a decent price, to give excellent value for your money. Lighter weight than other alternatives to reduce the user's fatigue. Two powerful 20-volt batteries to allow for enough runtime. Half an hour battery charging time. Built ruggedly for hard use around the house. High-performance motor and options between two high speeds. Features an LED light for practicality. Large and soft case to keep your kit organized and easy to transport. Excellent support and value for the money. Batteries are currently not interchangeable with other DeWalt cordless tools.